Hereby I upload my first rms in the Blacksmith. The map is based on ideas of preivous maps, although the map has been scripted by a different way. As the title says, the map is a War Lake surrounded by massive forest and players land is basicly close to the water. The map has 4 different themes, all of them are equal intresting imo. In the v1.1 the resources are fixed and plenty, i might make a v1.2 of the map and randomize the resources between low-rich .. but for now its ok,i think. The map has plenty of Eye-Candy but not enought to make you feel dizzy. 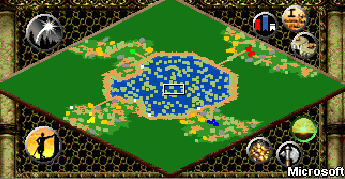 The map was designed to give players a defensive position and lot of space to evelope aggresivly ,too. 2:There is a crash during Loading.. ratio of 1:5 or 1:6.. Comments, reviews, and suggestions for improvments are happily welcomed. 1.PLAYERS LAND is closer to water now! 3.CANDY_3 (nine bands,roman ruins, old stone head, rock) are not beeing created on WATER anymore!! In my opinion, there was TOO MUCH eye-candy alot of the time (For example, the 'nine bands' looked very weird on water). I'd just remove most of it and stick to moss and flowers. Also, you may want to increase the starting gold and stone as there aren't any more around the map. I haven't tried a proper game of this yet, and may give extra feedback afterwards. But so far, pretty cool map, especially for a first try. I've made a post on the Forum in AI&RMS section about this problem..I didnt liked it aswell to see candy on water, but i figured it out today !